On softer metals like aluminum, copper, and brass, our Scotch-Brite(TM) Metal Finishing Wheels are used to blend out minor surface imperfections and handling marks while providing the desired decorative finish on products such as builder's hardware, and plumbing fixtures. Typically used on stationary machinery, the wheels are available in diameters of 6 to 16 inches and widths of 1/2 inch and greater. This highly conformable wheel is convolutely wound on a core to run smoothly and help create professional finishing results. Available in grade CRS and MED. 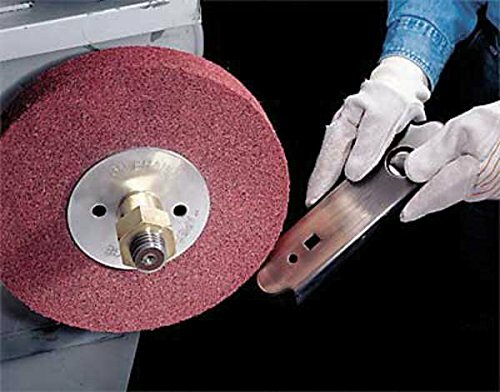 Our Scotch-Brite(TM) Metal Finishing Wheel uses aluminum oxide abrasive. Due to its high cut-rate, hardness, strength, and low heat retention, aluminum oxide mineral is widely used in grinding applications in addition to sanding and finishing use. Aluminum oxide is suitable on a wide variety of substrates in both woodworking and metalworking, including ferrous alloys. Scotch-Brite(TM) industrial abrasives are unique surface conditioning products with abrasives incorporated into non-woven nylon or synthetic fibers. Combining abrasives with the fibers creates an abrasive system that delivers consistent results for the life of the product. We chose an open-web material that runs cool and is load resistant, which keeps the abrasive minerals cutting at high performance by limiting clogging of the fibers.